Sattu paratha recipe with step by step photos. Healthy and tasty Indian flat bread stuffed spiced roasted chickpea flour known as sattu in India. Sattu paratha is a filling and healthy Indian breakfast that you can prepare easily. Sattu is a healthy ingredient that you can introduce in your diet for its nutrition. Sattu is roasted chickpea flour with wonderful aroma. I recently had a delicious sattu drink at a friend’s place. She said sattu is a staple in Bihar state. She also gave me some easy sattu recipes. This recipe of sattu paratha is best recipe to start using sattu in your diet. I have used organic sattu flour from 24 mantra organic range. You can use any type of sattu to make paratha. The filling for this paratha is very flavorful and delicious. I have added loads of onions and green chilies in sattu stuffing. Use butter or desi ghee to fry the paratha. You can serve sattu paratha with raita or any choka. I served with tomato choka and plain curd. 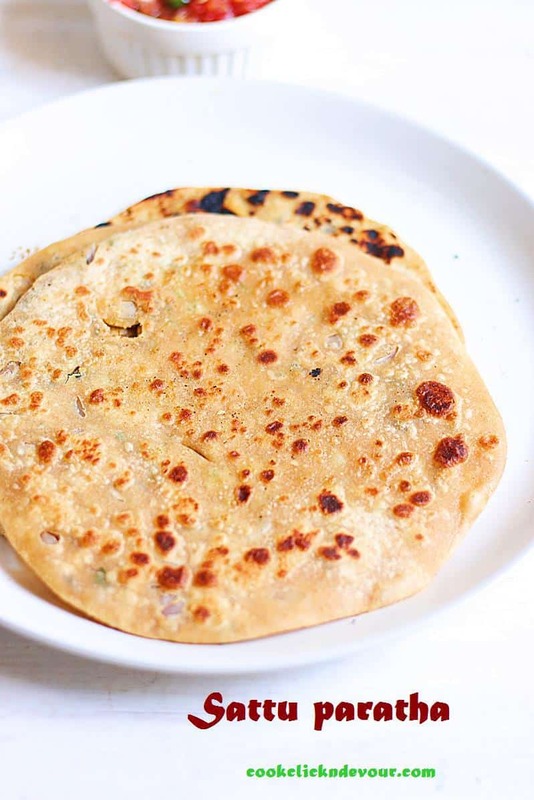 If you are looking for more paratha recipes do check aloo paratha, gobi paratha, mooli paratha, methi paratha recipes. How to make sattu paratha recipe. Mix wheat flour, oil and together. Add water gradually and mix well. knead into a soft and smooth dough. Set aside for 20 minutes. Take chopped onions, green chilies, coriander leaves, minced ginger garlic in a mixing bowl. Add sattu flour, chaat masala powder, salt and mix well. Add 1/4 cup water to make soft filling. Divide the paratha dough into 10 balls. Roll a dough ball into a small circle. Place the stuffing in the middle and close from the edges. Seal and roll into thin paratha. Heat a griddle or tava well. Spread some butter or ghee. Place the paratha on hot griddle or tava. Cook from both sides until the paratha turns golden with few brown spots. Heat a griddle or tava well. Spread some butter or ghee. Place the paratha on hot griddle or tava. Cook from both sides until the paratha turns golden with few brown spots. Serve hot. I bought a pack of sattu by mistake and I was wondering what to do with it. I tried this sattu paratha and was bown away by the taste. You saved me from wasting a wonderful ingredient. Your recipes are always a hit. Thanks a lot!